Spring 2008 was undoubtedly a very cold and wet affair with temperatures mostly between 40 and 45 degrees fahrenheit for weeks. The prevailing winds coming from the east or north east carried with them myriads of aphids which brought most new growth on the plum trees to a halt. 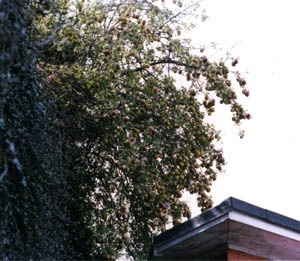 The problems did not stop there – the damaged foliage became infested with brown rot which spread to the new extension growth and killed it within days. Most plum trees looked pathetic. I had to spray them with an aphicide eventually to save the trees. The resulting fruit set was not good. Out of 25 varieties of plum, gage and damson, only five set reasonable crops. These were the local Johnny Roe, Reeves Seedling , and Jefferson’s Gage, but heaven knows how the latter managed a crops as it blossoms in late March to early April, is not self fertile and has little or no companions at that time with which to cross pollinate. Giant Prune, top of my list of ‘must haves’, showed yet another attribute producing a heavy fruit set at low temperatures. My pears fared little better than the plums, even the usually ultra-reliable Black Worcester failed spectacularly to set fruit at these low temperatures. Notable successes in the open were Beth (another ‘must have’) and Conference; unfortunately most of the fruit set on the Conference cordons is parthenocarpic. The pears against panel fences – Doyenné du Comice and Louise Bonne of Jersey – produced excellent fruit set – due to a slightly enhanced micro-climate provided by the fence panels. Dr Jules Guyot as a small pyramid and an oblique cordon set a substantial crop this year. Guyot’s season is round ten days earlier than Williams’ Bon Chrétien and does not suffer from scab in my orchard, which is more than I can say for Williams’. The fruit turns a beautiful straw yellow when ripe, but quickly goes over. Two out of three espalier pears against fence panels produced a good fruit set. The third – Beurré Hardy – had virtually no blossom buds this year. The fence panels obviously give an enhanced micro-climate even in April; cold winds lift several yards before the fence panels and pass over the top. Apple blossom was splendid and plentiful, but by this time temperatures had risen and fruit set appears promising. Two of the best displays came from A.W. Barnes, a highly colourful cooking apple and Crowngold, a beautiful red and gold fruit. With a sudden drop in temperature in late September and October this is more of a peach than an apple. Unfortunately it is a martyr to canker and scab. Much of the soft fruit has produced the best fruit set for years, with full strigs of currants. The racemes of Red Poll are five inches long and now fully loaded with green fruitlets. Invicta gooseberry, as usual, has produced considerable quantities of fruits which are ready for thinning. Thinning coincides with elder coming into flower and the signal for making green gooseberry jam and elder flower jam and wine. It would be interesting to learn about fruit crops in other parts of the country and how the cold spring affected other gardeners’ orchards. Cherry Pests in the UK – information please? How difficult is to control the pests in cherry in the UK ? What are the major locations of cherry cultivation in the UK ? The reason I am asking this is that a company in Canada sells netting for cherry trees in British Columbia, Canada and it has proved very effective in the control of cherry pests. There are plans to introduce the netting in Europe as well and hence I am looking for information on cherry trees in the UK. This is a picture of an apple tree beside the railway line at Three Bridges Station in West Sussex taken in April 2008. A small tree with branches cascading down the railway bank it was covered in apples in April and May. The tree flowered in April. The apples in the sun were beginning to turn from green to brown and the ones in the shade were still green and conical in shape. All the other trees along this line between the Sussex Coast and London had long since dropped their crops, but this small tree had several hundred fruits on it with just a few beginning to fall. It seems astonishing that the fruits were still on the tree in May. Summer Pruning of Plums: advice please? 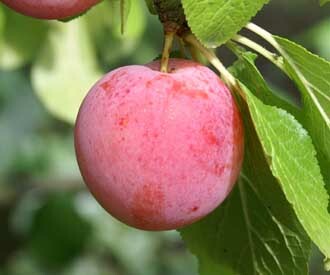 Can Adrian Baggaley or anyone else advise on the summer pruning of cordon and other forms of trained plums. I have read somewhat contradictory advice. Some recommend pinching back to 6 leaves during the summer and then pinching any secondary growth back to one leaf. Others recommend pinching back to 6 leaves during the summer and then pruning back to 3 leaves in August which then obviously removes any secondary growth. The amateur fruit grower in Britain has been well served since the 1940s by the authors of pamphlets, manuals, encyclopaedias and even ‘bibles’, covering the basic questions of how to grow fruit. However there is a real dearth of knowledge in published form for the benefit of the first time enthusiast, explaining the impact of rootstocks and methods of training on the flavour, ripening and all-round qualities of the fruit so produced. It is very much hoped that amateur growers and collectors represented by Adrian Baggaley’s generation will within the not too distant future pool their experiences and present them in a pamphlet or book form to assist the first-time grower in the all important task of just what to grow and what combination of rootstock and method of training to choose. For years I grew the Delwinor pear, known as Invincible, as a vertical cordon. A prolific cropper of handsome fruits, all of half pound size, they not only stand up to coastal winds, they have excellent keeping properties. But they are only culinary quality, and at that remarkably flavourless. Then I met Adrian and he revealed the pear’s worthy dessert qualities . It seems that like so many fruits these qualities cannot be produced when grown as cordons! They need to be grown as dwarf pyramids or bush or standard trees. This is an area of investigation that is perhaps only possible for amateurs to undertake. There is no profit in it for commerce. There are now some excellent technical manuals in the RHS Lindley Library which explore the pathways by which fruit trees produce their fruits and the flavours and ripening processes unique to each fruit. But the amateur needs a reliable means of matching variety to rootstock and to method of training to have a reasonable chance of producing quality dessert fruit. I have no doubt that some will find Adrian’s critical stance, as expressed in his recent articles towards much of the accepted wisdom of journalists, TV gardeners and the glossy adverts of commercial nurseries hard to digest. But with the burgeoning of magazines carrying front page headlines – ‘Easy to Grow Apricots’ – it is high time to call a halt to cheap practise. Leaving aside the vagaries or shortcomings of some commercial catalogues, there is a treasure trove of flavours and qualities in the National Fruit Collections at Brogdale. Those nurseries that access the Collections for graft or budwood should be well sign-posted for the first-time grower and the would be amateur collector. The future for quality fruit production and the safeguarding of the National Collections belongs in our back gardens, on allotments and in community orchards no less than in school projects. On the matter of heavy rainfall, which Adrian mentions in his article on plums, I noticed last year that McLoughlin’s Gage was not diluted in its usual richness. Denniston’s Superb lived up to its name gown as vertical and oblique cordons. I am finding that Reine Claude Violette (syn Purple Gage) is a consistent performer, but like many grown as an oblique cordon the fruit bearing wood tends to be high up. The much heralded Jubileum is prolific, but a martyr to moths and only of true dessert quality one in three years. The surprise among plums has to be Reeve’s Seedling. Grown as a vertical cordon it has real flavour, is easily managed at a height of seven feet, so ideal for a fruit cage. It is not over vigorous and there is no problem with air movement through it or access for light to ripen all its fruits. As dwarf pyramid or bush, I would guess it is capable of even better results.